Toronto, Ontario--(Newsfile Corp. - June 20, 2018) - Palamina Corp. (TSXV: PA) has completed further staking to expand its five 100% owned, district-scale gold projects in the Puno Orogenic Gold Belt ("POGB") located in southeastern Peru. The POGB is one of the least explored known orogenic gold belts. Palamina's projects in the POGB now cover over 77,000 hectares. All projects have been ground-truthed by artisanal, small-scale and informal miners who are generally limited to mining gold from the top 100 metres below surface. No previous systematic exploration programs have been carried out on Palamina's gold projects. The Company has used recent geochemical and prospecting results to direct to staking over potential extensions to existing gold mineralized zones. Andrew Thomson, President of Palamina, stated, "Palamina has expanded its land holdings by applying for an additional ~25,000 hectares to cover structures along strike from known gold occurrences. Staking took into account Palamina's upcoming heli-borne geophysical program and geochemical results from recent sampling programs. The 3,000 line kilometre airborne survey will cover Palamina's Coasa, Gaban and Cori gold projects. Currently Palamina has two prospecting teams in the field primarily sampling and mapping on its Coasa gold project to better understand the gold potential within and surrounding the Phusca shear zone which spans the property." In June 2018, additional mining rights were made available for staking by the Peruvian government. At Coasa, increased staking was carried out to secure a total of 16,400 hectares, including areas on strike from anomalous gold occurrences within and in association with the Phusca shear zone. At Bendi, pursuant to recent follow-up field visits, the mining application rights now cover 18,900 hectares. Palamina has increased its mining rights to 19,300 hectares at Gaban and 17,600 hectares at Cori to cover structural extensions along strike from small-scale hard rock gold mining operations. These new application areas are to be included within the area to be flown by the heli-borne geophysical survey in order to assist in the identification of prospective structures that are masked by organic cover. Once processed results from the heli-borne study are received, follow-up surface exploration will be designed to identify and locate gold bearing quartz veins within or in close association with the identified regional shear zones. Heli-borne magnetic study results are expected by mid-August 2018. Mr. Donald McIver, M,Sc Exploration and Economic Geology, a Fellow of the Australian Institute of Mining and Metallurgy (FAusIMM), as well as the Society of Economic Geologists (FSEG), is Vice President Exploration for Palamina Corp. He is a Qualified Person as defined by National Instrument 43-101 and he has reviewed the geological and technical contents of this press release. 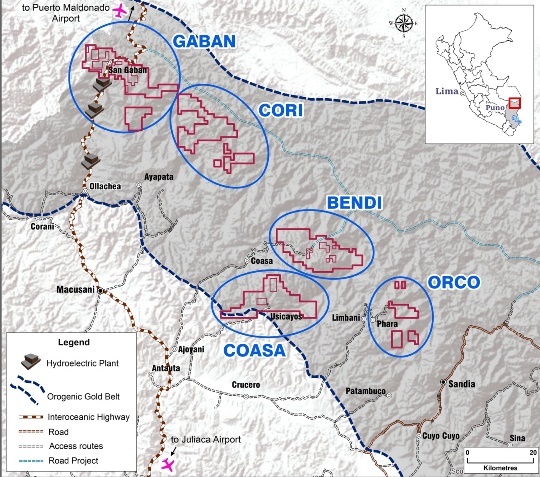 Palamina has acquired the application and mining rights to five gold projects in southeastern Peru in the Puno Orogenic Gold Belt (POGB), one copper-gold project in the coastal I.O.C.G. belt in southern Peru and holds 100% interest in one exploration project in Mexico. Palamina's Peruvian based exploration team have a cumulative 35 years' experience in the POGB and are supported by a board of directors and advisors who are proven mine finders, deal makers and financiers. Palamina has 29,621,381 shares outstanding and trades on the TSX Venture Exchange under the symbol PA.